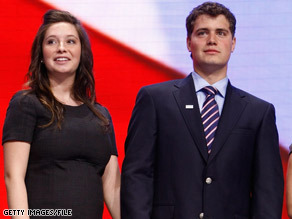 Bristol Palin and Levi Johnston joined the rest of the Palin family onstage during the Republican convention in September. WASHINGTON (CNN) – After being thrust into the national spotlight during the presidential campaign, Alaska teenager Levi Johnston and his family are once again back in the headlines. His mother, Sherry Johnston, was arrested Thursday on drug charges by Alaska state police, the Anchorage Daily News reports. Levi is the boyfriend of Bristol Palin, eldest daughter of Alaska Gov. Sarah Palin, who was the 2008 vice presidential nominee. When Gov. Palin revealed that the two teenagers were having a baby out of wedlock it became a major news story shortly after she was chosen by Sen. John McCain to be his running mate. CNN has confirmed that Sherry Johnston was arrested on six felony counts of misconduct involving a controlled substance at her home in Wasilla, Alaska. The Baby Jesus was born out of wedlock and is He is God in the flesh! Merry Christmas.